Worthing, Burgess Hill and Lewes all discovered their FA Trophy second-round qualifying opposition earlier this afternoon. 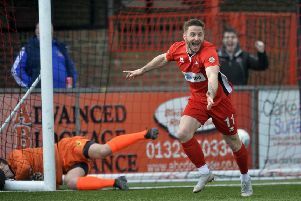 Adam Hinshelwood's Worthing, who bagged a 3-0 first-round qualifying win over fellow Bostik League Premier Division Lowestoft Town on Saturday, have been rewarded with a trip to division-lower Southern League East outfit Thame United. Thame were promoted as Hellenic Premier Division champions last season but Worthing will be hoping to progress to the third and final qualifying round of a competiton they reached the second-round proper in last season. Burgess Hill have been handed a tough away draw against high-flying fellow Bostik League Premier Division Hendon. Hendon currently sit second in the table, though, Hillians will look to build on their 2-0 first-round qualifying victory over Aveley in the previous round. Bostik League South leaders Lewes are the only Sussex team to be drawn at home. The Rooks entertain division-higher Southern League Premier Bishop's Stortford for the right to earn a spot in the third qualfying round. Stortford were relegated from the National League South last term and currently sit 18th in the Southern League Premier Division. All ties are to be played on Saturday, November 11 with winners from each taking £4,000 in prize money.